In 1866, Oliver Winchester’s newly renamed company, the Winchester Repeating Arms Company, finalized the idea of the repeating rifle. 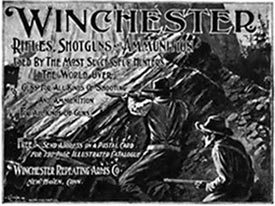 Their rifle, Model 1866, became the first Winchester, and was known as “the gun that won the West.” With over 150 years under their belt, Winchester has remained a standard in the industry and has expanded over the years to include products such as firearms, ammunition, large gun safes, and handgun and pistol safes. Now, under the production of Granite Security Products, Inc., Winchester gun safes remains an industry leader and has expanded over the years to include products such as firearms, ammunition and large gun safes. Now, under the production of Granite Security Products, Inc., Winchester gun safes remain an industry leader. Their corporate operation is based out of Fort Worth, TX. Production remains offshore. Winchester Safes consists of personal electronic safes as well as three gun safe series. There are several differences in the safe series, but the standard similarities include a convertible interior, screen-painted graphics, powder paint finish, and the Palusol door seal. This seal protects against air and cold smoke, and when activated at higher temperatures, it turns into a non-combustible foam with a high level of thermal insulation, ensuring continuity in sealing and forming an effective barrier to the passage of fire, hot gases, and smoke. A Winchester Safe comes with a limited lifetime warranty against defective materials or workmanship, as well as protection and replacement of any damage caused by burglary attacks or fires.